The night is still on a Christmas Eve in the Peruvian highlands. Visited by shepherds with lambs and llamas, baby Jesus sleeps in a hay-filled manger. White ducks swim in a cool blue pond and the sky is ablaze with stars. 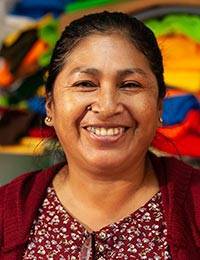 Leonor Quispe works in the traditional art of arpillería (patchwork) to create an heirloom Christmas stocking. Each tiny figure is crafted in three dimensions and lavishly embroidered.